eCertify is migrating to essCert – All new users will be accessing the upgraded essCert platform, while current users will be switched in due course. 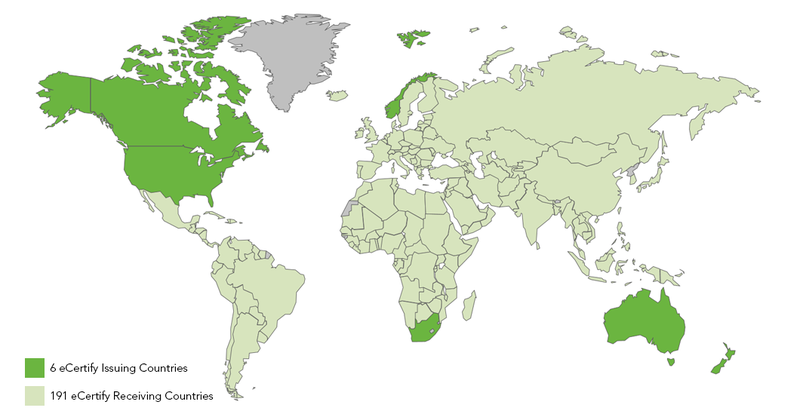 eCertify’s electronic Certificates of Origin (eCOs) are accepted in the 191 countries below. Please note that if the country you import into or export out of is not listed below, that is only because eCertify has had no customers shipping into or out of those countries to date. Our eCOs are based on the United Nations International standard which is accepted worldwide. Companies searching for savings and efficiency gains use eCertify, the user-friendly online solution that transforms the costly, time-consuming paper-based process for stamping and signing of Certificates of Origin into a streamlined electronic system. eCertify is an essDOCS Certification solution.